Fry up a batch of Mindy Segal's fluffy, sugar-coated desserts. 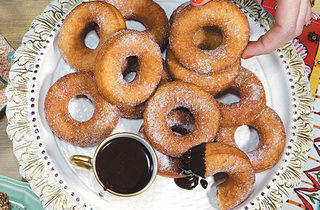 Fry up Mindy Segal’s fluffy, sugar-coated doughnuts for breakfast or an after-dinner treat. 1. Begin with the starter: Heat milk to about 90 degrees. Remove from heat and stir in yeast with a fork. Let the mixture sit until it gets creamy and foamy, about five minutes. (If mixture doesn’t foam, start over with new yeast.) Mix in egg and egg yolk with a fork. Add one cup of the flour and mix with a wooden spoon until a dough forms. Pour the rest of the flour over the top of the mixture (don’t mix it), cover with plastic wrap and let rise in a warm place for about an hour, until it has doubled in volume. 2. Make dough: In the bowl of a standing mixer, combine starter, eggs, sugar, flour and honey. Fit the mixer with a dough-hook attachment; mix on low speed. Add salt. Mix until dough comes together, pulls away cleanly from the sides of the bowl and forms a ball, about three to four minutes. Add softened butter one tablespoon at a time, waiting to add more until the last bit is incorporated. When all of the butter is added, you should have a soft, smooth, shiny dough. Place it in a greased bowl, cover with plastic and refrigerate overnight. 3. In the morning, let the dough sit in a warm place for three hours—it should come to room temperature and have risen slightly. On a lightly floured surface, roll out the dough approximately a half-inch thick. Cut doughnuts with a cookie cutter (HotChocolate’s are two-inch circles); cut hole in the middle of each doughnut using a smaller cookie cutter and set aside to rise in a warm, draft-free space until they’ve risen and are slightly puffy, about 30 minutes. 4. 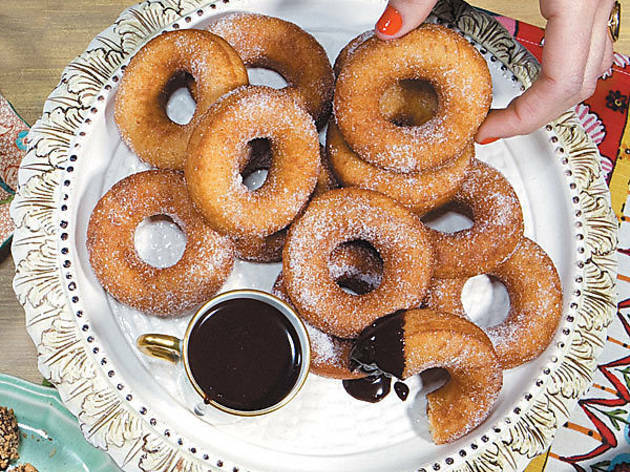 While doughnuts are rising, make ganache. Roughly chop chocolate and place in a medium mixing bowl. Set aside. In a small sauce pot, bring heavy cream to a boil. Pour over the chopped chocolate, coating entirely. Let sit one minute, then whisk cream and chocolate together to form a smooth, shiny ganache. 5. Attach a deep-fry thermometer to a heavy pot, and heat about three inches of canola frying oil to 350 degrees. Fry the doughnuts two or three at a time, about one minute per side, until golden brown. Remove from oil, drain on paper towels and toss in granulated sugar to coat while still warm. Serve warm with a small bowl of chocolate ganache for dipping. • A deep-fry thermometer ensures the proper temperature—find one for $12.95 at Sur La Table (755 W North Ave, 312-787-5111). If the oil isn’t hot enough, the doughnuts won’t crisp evenly and will become soggy. If it’s too hot, the doughnuts will cook on the outside but remain undercooked on the inside. • Don’t have a cookie cutter? Cut out the doughnuts with an upside-down measuring cup, then unscrew the removable KitchenAid imprint from the front of the mixer and use it to cut out the middle.